EMDB - What movie do ya wanna add today? Any PC / Tablet running Windows 2000 / XP / VISTA / 7 / 8 / 10. EMDB will not run on Windows RT. 9MB free disk space (excluding the database and thumbnails). Minimal screen resolution 1024 x 768. You can change the language of the user interface of EMDB to several different languages via the general tab of the Options dialog. No need to save your data. All changes will be saved automatically. NEVER use import / export to backup your EMDB data!!! The export is intended to move your data to another application. It does not contain the complete content of the database. Always use the special Backup feature in the options dialog. EMDB automatically creates a backup of your data . By default this done every week. The backup is located in the folder EMDB is installed in and is called ‘backup.dat’. The previous one is called ‘previous_backup.dat’. You can restore a backup using the Restore button in the Backups section of the Options dialog. When installing a new version also a backup is created: it's called backup###.dat were ### is replaced with the previous version. EMDB stores its data (database, thumbnails, automatic backups, configuration file) in the same folder it is installed in. An exception to this is when you are running Windows Vista or Windows 7 and installed in the Program Files folder (the default location of the installer). In this case the database, thumbnails and configuration file will be stored in an EMDB folder in your Documents folder. The HTML output will by default be exported to your Documents\EMDB\HTML folder. The main window of EMDB consists of a toolbar to access most used functions, a list showing all movies and a movie info panel showing a lot of info about the selected movie including a thumbnail of the DVD cover if available. The list can be expanded to get a better overview. This causes the Movie Details Panel to disappear. You should use the arrow button just below the list for this. You can always bring back the movie info using the same arrow button. Main Window in Full List mode. Using the View Mode Button you can toggle between the Bookshelf and List Mode views, both with or without the Movie Details Panel. You can resize the main window by dragging the 'gripper' on the bottom right of the window or reposition the window by dragging the caption. You can also use the minimize and maximize buttons on the top right. The position and size will be remembered when you close the application. Toggle between Bookshelf and List Mode. Show the Movie Details Panel. Hide the Movie Details Panel. Quickly navigate through the Bookshelf or List. Select movies from current location. Open the Add Movie window. Open the Edit Movie window. Play the currently selected movie. Quick Search. Selects the first movie which title matches the typed character(s) (Just like in Windows Explorer). Moves to the next movie found with Quick Search. The thumbnails from IMDB are rather small and are usually a film poster or the front of the DVD case. EMDB is designed to use larger thumbnails in the format of a full DVD case insert. These images are available via a lot of websites. In the [Links] section are some great ones listed. You should download the images and use the Browse button in the Add / Edit Movie dialog to select them. EMDB creates a copy of the thumbnail. The original image is not needed afterwards to display the thumbnail when the movie is selected. 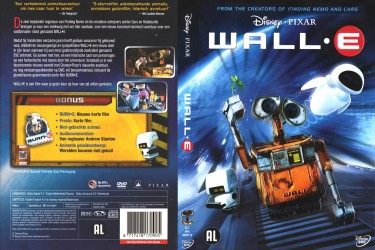 Wall-E thumbnail created from a DVD insert. The toolbar contains buttons to access the most common actions. Clicking this button opens a dialog were you can enter new movies. Clicking this button opens a dialog were you can edit the currently selected movie or just view its data. You can edit multiple movies at once by selecting them in List mode using the default windows Ctrl-Click (expanding the current selection) and Shift-Click (making a new selection from the previous selection util the new selected line). Opens the Add Movie Dialog to insert a new movie at the selected position in the list or on the shelf. Clicking this button deletes the currently selected movie. A confirmation dialog is shown before deleting. The delete button is disabled by default to prevent accidental removal of movies. It can be enabled in the Options Dialog. You can also delete multiple movies at once by selecting them in List mode. Also accessable via the [Del] button. Clicking this button launches the default mediaplayer and starts the movie if the file location is entered in the location field and the type is one of the supported types (all common types like *.avi, *.mkv, *.wmv, *.iso, *.vob, ...). Also accessable via [Ctrl-P]. Clicking this button enables you to make a selection of your movies based on different criteria e.g. part of the title, actors, director, genre or a combination. The result will be shown in the main window. You can go back to the full list using the Filter -> Show all movies option. Also accessable via [Ctrl-F]. Clicking this button shows a menu were you can filter your movies on several criteria: Loaned, Seen, WishList, TV Series, SD / HD (standard definition / high definition). The result will be shown in the main window. You can go back to the full list using the Filter -> Show all movies option. Clicking this button shows a list of properties on which you can sort your collection. Selecting the same item again reverts the sort order. The sort property and order will be remembered and re-applied the next time you launch EMDB. Clicking this button shows a dialog were you can print several different lists like All movies, Loaned Movies, a specific range of movies, current Search Results. Also accessable via [Alt-P]. Clicking this button shows a dialog were you can export your movies to HTML (e.g. to put them online or on a smart phone), Excel (comma seperated value format) or plain text. Clicking this button shows a dialog were you can add a movie file or the complete content of a folder including all subfolders to the database. Clicking this button shows a list of available databases to switch between. You can create additional database in the DataBase options. Here you can set many, many things to change the appearance and functionality of EMDB. Toggles between List mode and Bookshelf mode. Also accessable via [Ctrl-Tab]. Randomly selects a movie. Let EMDB surprise you with the movie you are going to see next. Clicking this button shows a window with version information, web and email addresses and info how to donate or order a customized version of EMDB. Closes EMDB. All data is saved. All settings are remembered. Also accessable via [Alt-F4]. The list shows all movies in the database. Select a movie from the list to view more info. You can select which columns are displayed in the OPTIONS dialog. The width of the columns can be changed by dragging the separation markers in the column header. The sorting can be changed by clicking on the column header of the column you want to sort on. Clicking again reverses the sort order. Double clicking the movie opens a new window showing all data of the movie. Here you can also change all items. Here the data of the currently selected movie is shown. To view all data use the Edit button or double click the movie in the list. The loan system enables you to keep track of people loaning your precious movies. You can enter the name of the person who loan the selected movie in the edit box. The current date is automatically added to the right of the edit box. The changes are saved automatically. When a movie is returned, just select the movie and hit the [Return] button. If you loan multiple movies you just have to type the name once. When you select the second loaned movie and using the [Loan] button the previous used name is reused. You can use the [Loan History] button to view the loan history of the selected movie.